Hey, guys! I might have missed a retracement last week, but this chart is telling me that it might not be too late to short the dollar against the yen. What do you think? 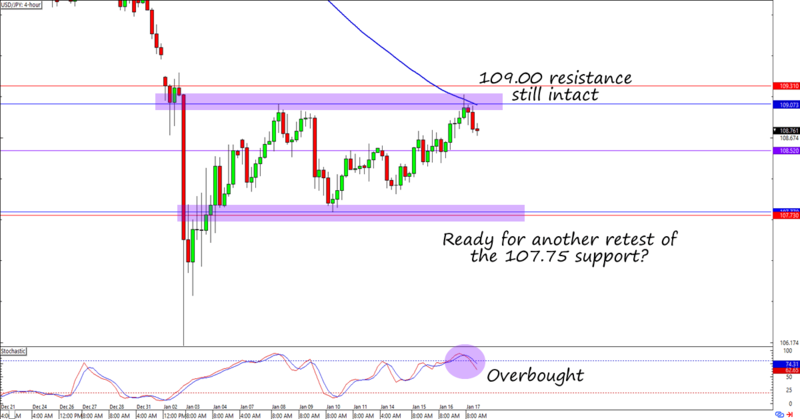 Last week, I talked about how USD/JPY might be finding resistance along a trend line that was also near the 100 and 200 SMAs on the 1-hour time frame. Unfortunately, price didn’t pop back up to my entry level. It looks like I still have a chance, though! As you can see, USD/JPY just turned lower from the 109.00 mark, which has been holding as resistance for most of January. This time around the 100 SMA on the daily time frame might have given the extra spook for the bulls. It’s not like Uncle Sam’s fundamental picture has changed much. In fact, I think it even turned for the worse. News that the U.S. is pursuing a criminal investigation of China’s Huawei for allegedly stealing trade secrets from U.S. business partners brought back tensions of the ongoing U.S.-China trade war. Of course, it doesn’t help that China has printed weak trade numbers AND that its central bank has been throwing everything but the kitchen sink at the economy to help stimulate activity. Last but not the least, the U.S. government is STILL partially shut down. Word around the hood is that the White House has revised its estimates to reflect 0.13% of GDP getting shaved off for every week that the government remains partially closed. If this keeps up, maybe we’ll have to survive on “hamburders.” Duhn duhn duhn. Anyway, I’m looking to short USD/JPY at its current levels and aim for the range’s support close to the 107.75 area. I’m planning on placing my stop just above the 109.00 MaPs and risk 0.50% of my account for it. I gotta watch out for a low key trend line forming on the chart, though. If the pair fails to break below this week’s open price, then I might have to make adjustments to my trade. Anybody else with me on this trade? Hey, guys! As part of my new year’s resolution to be more active in my discretionary trades, I’m sharing this potential retracement setup that I spotted. What do you think?